When people think about where to get great Asian food in Houston, “Katy” may not spring to mind — but with the opening of Katy Asian Town center, it’s time to rethink that perspective. A case in point: Houston Chronicle restaurant critic Alison Cook recently honored Phat Eatery with a glowing review and shined her spotlight on a number of dishes. These include the rich and hearty Beef Rendang, textured Sizzling Tofu and the Nasi Lemak platter, which she cited as her favorite there. “I’d venture the 30 miles west just to eat this dish, and the roti canai, and to shoot the breeze with the hospitable [general manager Kevin] Lee and [owner Alex] Auyeung,” writes Cook of the platter. 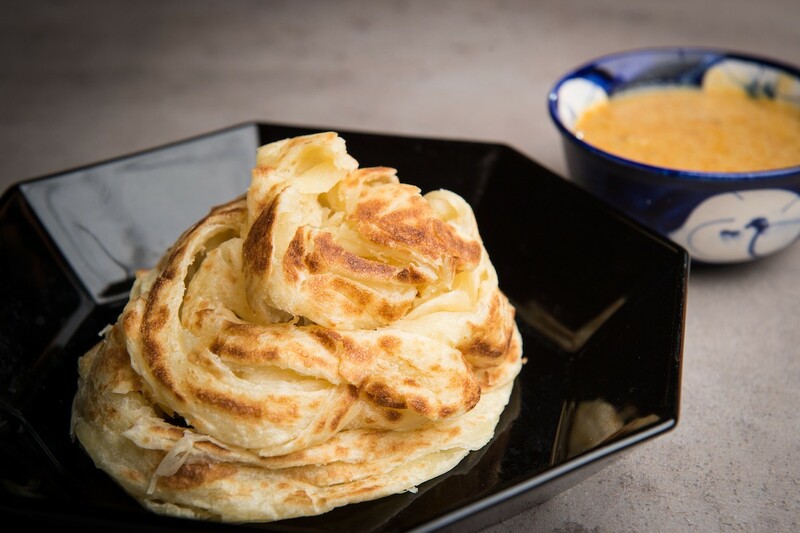 Roti Canai, a type of warm, layered, Malaysian-style bread, at Phat Eatery in Katy. Photo by Chuck Cook Photography. Cook also noted Phat Eatery’s open, welcoming atmosphere as well, citing the eclectic mix of diners ranging from families to corporate types. The restaurant stands ready to serve everyone from those very familiar with Malaysian cuisine to diners looking for an easy and fun introduction. Speaking of easy introductions: visit Phat Eatery at lunchtime Monday through Friday to try the restaurant’s $9 lunch specials! These include four different wok-fried dishes with rice and a choice of antibiotic-free chicken, tofu, shrimp or beef. The ingredient combinations include the mild Sweet Basil with red and green bell pepper, onion, snow pea, mushroom and the spicy Chile with torched ginger, bell pepper, egg and egg with a sweet and savory tomato and red chili sauce. There are several other $9 lunch specials, including three different curry noodle soups, two curry bowls and three kinds of fried rice. 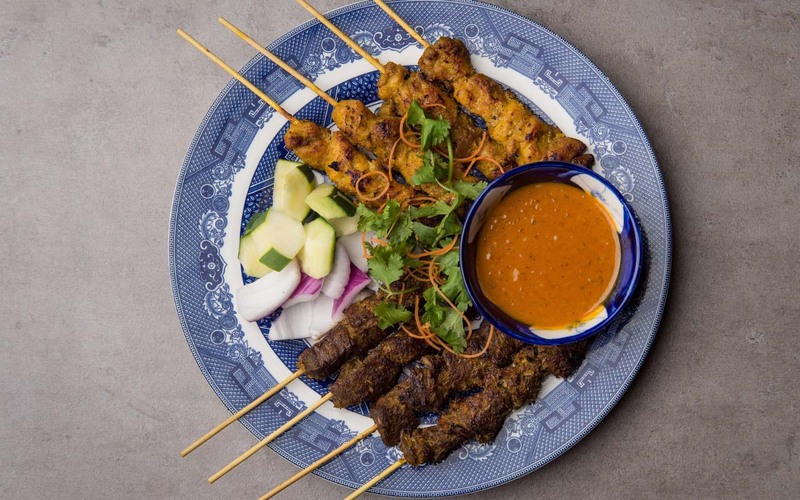 The Satay Skewers at Phat Eatery are available with chicken or beef and each is accompanied by peanut sauce. Photo by Chuck Cook Photography. The fun doesn’t stop with dining in, either. Phat Eatery’s vast party menu includes trays that serve up to 20 guests. There are starters called “Phat Bites” that include Roti Canai (Indian flatbread with curry dip), Salt and Pepper Calamari and Satay Skewers with beef or chicken. 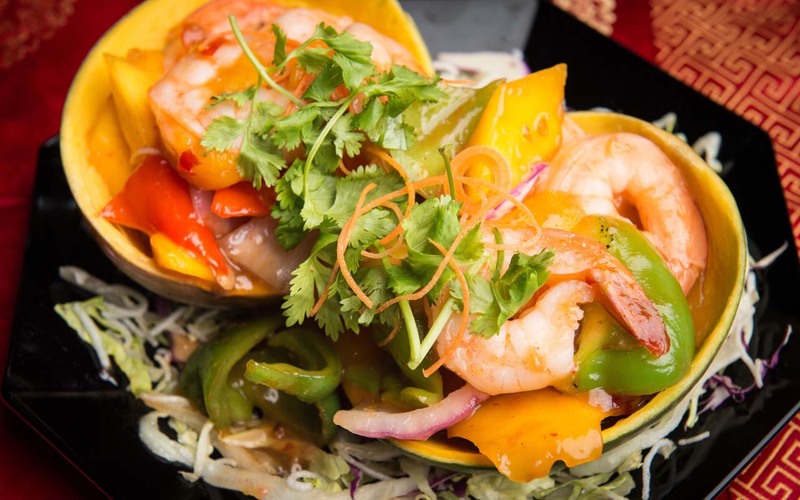 Heartier options include Mango Shrimp Salad tossed in a spicy tangy sauce, sweet and sour Manis-Dan-Masam chicken that is lightly battered and served with fresh pineapple, cucumber, bell pepper and onion. Additional options include assorted beef and seafood dishes plus stir-fried noodles, several variations on fried rice, and stir-fried vegetables with various sauces. Whether for a business lunch, date night or family dinner, everyone can discover something at Phat Eatery that they love. Visit Phat Eatery at 23119 Colonial Parkway in the new Katy Asian Town to experience these acclaimed dishes for yourself.